Whether you’re booking your first client or you're joining HoneyBook hundreds of clients deep, we aim to make it easy to get those connections imported and recorded in HoneyBook via your Contacts tab. There are several ways to add your clients and contacts to HoneyBook. 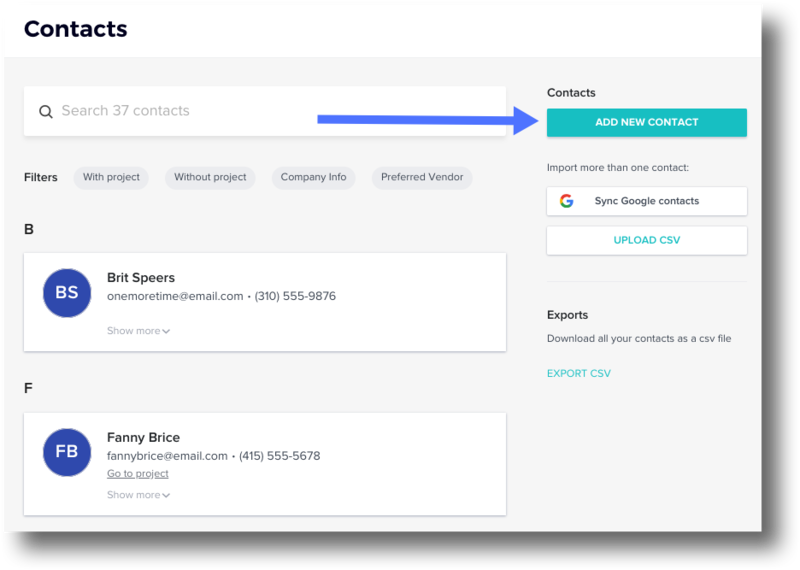 You can add them in the process of creating a new Project; add them individually to your contact list; or add them all at once, using a CSV import. We've detailed the steps for each method below! Once your contacts have been added, you can always access your full list under the Contacts tab. 1. From your HoneyBook dashboard, click the + New button. 3. Enter the client's name and contact information. You've now created both a client and a Project, and you'll be taken right to the Project's workspace. You can proceed as though you'd just added a Project by updating the Project details and sending out files. HoneyBook Tip: If you reverse this process and add your Project first, any participants that you add to the Project will also be added as contacts. 1. From your HoneyBook dashboard, click the Contacts tab. 2. Click Add New Contact. 3. Enter the contact's name and information. HoneyBook Tip: Other than the email address, it's okay to leave fields blank if you don't yet have that information for the contact. 2. Head to your Contacts tab. 4. Click Choose File and select your properly formatted contact list. The upload should begin automatically. How long it takes to complete can vary based on a number of factors, including how many contacts are in your list. Since it could possibly take some time to finish, feel free to keep taking care of business in HoneyBook and we will notify you when the upload is complete—you should receive an alert in your Notification Center. If you receive an error when trying to upload, please double check that your column headers exactly follow our CSV template (with no additional column headers added), that your file is in CSV or XLS format, and that the file does not contain more than 500 contacts. You should receive an alert in your Notification Center that the upload (or a part of the upload) has failed. Can't find a contact you uploaded? If you can't locate a client or contact after searching their name or phone number, be sure to search using their email address to ensure their other contact details are correct. It's also important to note that if an email from the CSV upload matches an email that you or another HoneyBook user has added into HoneyBook, but the surrounding information (i.e. name) is different, our upload will skip over and not replace that entry.